I am making a few home-made treats for the family for Christmas this year, and one of those will be some sugared almonds for my dad. Many years ago when I visited Croatia, we had stopped by an old family friend’s place for a drink and they served up some home made sugared almonds to have with our coffee. I will never forget them. They were so imperfect and wonderfully sweet and crunchy. They were nothing like the Vienna Almonds you can buy at the store…even though I love those too (I am a massive sucker for nuts – candied or roasted and salty). I tried a couple of years ago without the help of a recipe or a sugar thermometer and I believe the results were fine. However, I have tried a new recipe lately and – now aided by the sugar thermometer I got last Christmas – I have had marvellous success. I know most people don’t have sugar thermometers lying around, but I will offer advice on how to get the same result without one. Put sugar and water in a pot, on low heat and stir to dissolve. Bring to the boil, uncovered and without stirring simmer for about 5 minutes +, or until the thermometer reaches 116C or until it gets syrupy. You can pop the nuts in as soon as the sugar mixture dissolves if you want or you can remove pot from heat and stir in nuts until the mixture dries and crystallises. Return to low heat and stir for another 5-10 minutes or until the nuts start to go golden. Keep stirring or the nuts will burn on the bottom. Put the nuts on a baking tray and cool. My main piece of advice is don’t cook the sugar too quickly or too hot. If you do, you will notice the sugar just stays liquid and gets browner instead of drying up and crystalising. Also, you can simply add the butter after the nuts have crystallised and then pop on a tray in the oven. They can brown this way. You can also not add any butter at all. 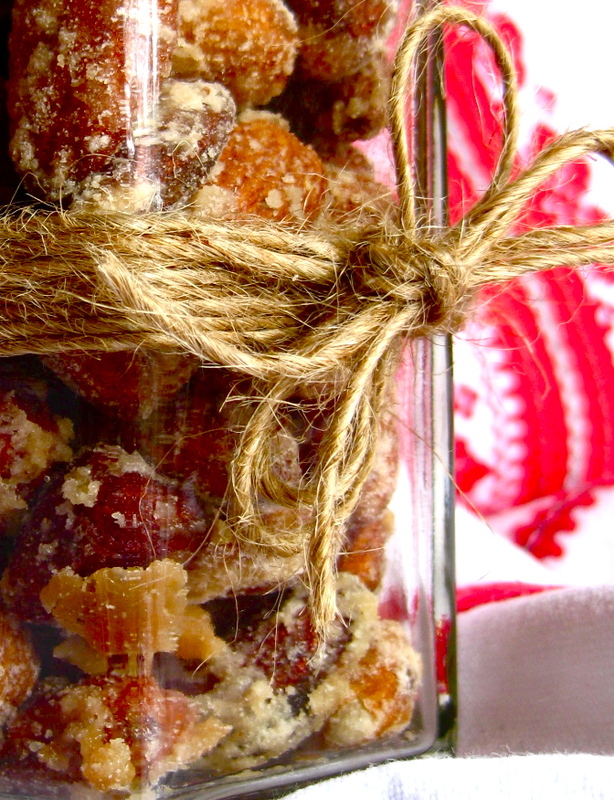 You can use any type of nut (cashews, almonds, peanuts, pecans, macadamias) for this recipe. You can have mixed or one type and I believe using raw or blanched is best. When you test one out as soon they are cool enough to not burn your tongue…(I know you will)…don’t be put off if they’re not super crunchy. They need to be completely cooled to get really crunchy. Also, don’t be put off if they don’t work out exactly the first time around. Working with sugar is always a little tricky and practice makes perfect. If you practice with some peanuts, it won’t be too costly if you have to try again. My favorite sweets! Thnx for this great post!